I’m a firm believer of using harnesses and tethers to help keep the first rule of sailing on the ocean—STAY ON THE BOAT. In fact, in days of old, sailors weren’t encouraged to learn how to swim, since it would just prolong the inevitable should they fall off their ship. When singlehanding, as I often do, staying aboard is critical to staying alive. Once you fall off a moving sailboat, unless the sea gods are watching over you, the chances of getting back aboard are very low. In the colder weather, survival time in the water is measured in hours at most. The three components of clipping in are a harness, a safety tether and something to clip into. These can be hardpoints, like padeyes that are mounted in the cockpit, or jacklines that run much the length of the boat. I’ll address all of these in this article. Some like to have a separate harness and PFD. 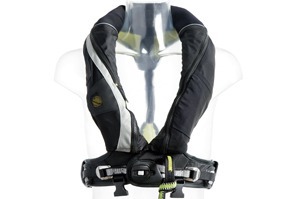 Others like a harness and PFD that are integrated into a single unit. Personally, I think it makes far more sense to have an integrated setup, since it means you have one less piece of gear to deal with. Also, in general, when you should be wearing a PFD is also much the same time you should be wearing a harness—and having the two combined makes it easier to get in and out of the gear, and reduces the amount of gear you have to carry and stow. Since, I am of the integrated harness school, that is what I will be discussing. The best PFDs are SOLAS-approved, and will have a strobe, a whistle, crotch or legs straps and a spray hood. These are important for trying to recover a MOB in heavier seas and bad weather, and key to helping prevent an MOB from drowning before he or she is recovered. The harness should be snugged up as tightly as possible, to reduce the amount of slack and reduce the possibility of injury should you fall. This will also help keep the PFD on you should you end up in the water. However, the real key to being safe is to STAY ON THE BOAT. One caveat there is about some of the integrated PFD/Harness units is that they have a minimum height requirement for safety reasons. For instance, the West Marine Offshore Sailing Type V inflatable PFD with integrated harness has a minimum height requirement of 5′ 8″ for the user. The reason for this is simple, the harness portion isn’t height adjustable, and if someone shorter than that uses the PFD/harness, there is a risk of serious injury should they fall and be stopped by the harness. This is because the harness belt could fall low enough to be over the floating ribs, and if the user falls, the ribs may be crushed and cause serious internal bleeding.Unfortunately, this isn’t very clearly marked anywhere, nor do the salespeople generally know this fact. The Spinlock Deckware Pro Harness with PFD and the Spinlock Deckvest are two units that I believe do not have this issue for shorter people. The reason is that the back side of the harness is height adjustable on both of these. These are SOLAS approved, but have not received USCG certification. Here is the Deckvest, which has since replaced the Deckware Pro with PFD. The best tethers are the ORC approved ones. These have a snap shackle at the body end, so that the tether can be released under load if necessary. They also have a stress flag built in that will show when a tether has been subjected to stresses strong enough to damage the tether and indicate that it should be replaced. Generally, you can have one or two “legs” on a tether. Snap Shackle: Only for use on the body side of the tether. I prefer a two-legged tether, with a 1-meter and a 2-meter leg. This is far more useful than a single leg tether, since the two clips allow you to clip in before unclipping the other leg—which means you can move about without ever being unclipped from the boat. The legs can either have a bungee inside the tubular webbing to retract them and help keep them out of the way, or be plain webbing. The bungeed ones are convenient, but the bungee usually fails after a few seasons. The boat side should have double action clips that require positive action to unlock them rather than spring clips. The spring clips can twist in such a way that they can work themselves free under stress. This defeats the purpose of having a tether. The most common hooks for the boat end are the Wichard and the Gibb hooks. The newer Kong hook shows great promise and, being made of aluminum, is quite a bit lighter than the other two. Wichard: Probably the most simple to use with gloves on or single-handed. Gibb Safety Hook: Some find this more difficult to operate with a single hand than the Wichard. Kong Safety Jackline Hook: Can have corrosion issues on saltwater due to its mixed metal construction. Simple Spring Hook: THESE SHOULD NEVER BE USED. Jacklines should run from almost the bow of the boat to almost the stern of the boat on both sides of the boat. In many cases, people will terminate the jacklines before the aft end of the boat by about a tether length, to reduce the risk of falling off the boat. They should generally be run inboard of the shrouds to allow getting to the mast more easily. However, if the boat has a swim platform or sugar scoop transom, terminating the jacklines near the transom is probably a better idea, since it can make it much simpler for the person to re-board the boat by allowing them to get to the swim platform. It is generally a good idea to make jacklines out of webbing, so that they can easily be recognized in the dark by touch and will be far less likely to roll underfoot should you step on them. Nylon or Spectra tubular webbing makes excellent jacklines. Rope can be used in a pinch, but it rolls under foot and can be mistaken for other lines or vice versa—leading to the possibility of clipping into the wrong line by accident. The best jacklines I’ve used were made from 1/4″ dyneema line with tubular webbing over it. The strength was provided by the line, and the webbing prevented the line from rolling underfoot, made it easily recognizable in the dark, and protected it from UV and chafe. If you use webbing for jacklines, don’t forget to put a few twists in the webbing before lashing it tight. The twists will prevent the webbing from humming or singing, which will drive you crazy in higher winds. At a minimum, the material used for the jacklines should have a minimum breaking strength of 6000 lbs.—that’s not a typo. A jackline may have several people on it and in the case of a knockdown or broach, those people will all be thrown to the limits of their tether and the jackline, and it best be able to hold them all on the boat. Dropping into a chair from a standing position can create a 10 G load… a spinnaker broach is probably going to generate at least that much in terms of acceleration/deceleration forces. So, if you have three 180 lb. sailors on a jackline, and the boat gets knocked down, you may see forces in excess of 5000 lbs on the jackline— given three 180 lb. people and 10 G’s of acceleration. Jacklines, like any other rigging on the boat, should be inspected regularly and replaced every few years. UV does take its toll on the webbing, and unless you’ve gone with the more expensive spectra-line within webbing solution, they will need to be replaced on a fairly regular basis. Often people will use cleats for this, but I think that purpose installed hard points make far more sense. First, many mooring/docking cleats are not designed for the loads that a jackline may impose on them. Second, using a cleat for a jackline reduces the cleats utility for its original purpose—docking and mooring lines. I would recommend putting in large padeyes to which you will lash or attach the jacklines ends. Back these well with a decent size piece of 3/8″ G10 Garolite fiberglass backing board. One major advantage of installing dedicated padeyes is that you can locate them properly. Putting them near centerline as you get to the foredeck makes them far more useful. You can often use the padeye for a hardpoint when working the foredeck as well as a place to terminate the jackline. You can also use two large padeyes in the cockpit to terminate the aft end of the jacklines, and then they can double as hard points for the helmsman to clip into. Bow/forepeak—can be used to terminate jacklines as well as for when working on the foredeck when anchoring or working on headsail changes or furler drum issues. By the mast—good for when working on reefing the sails, raising/lowering the main, etc. These can also be good for stowing halyards away from the mast and also stowing things like running backstays. In the cockpit—can be used to terminate the aft end of the jacklines, also good for clipping into when entering/exiting the cabin, when at the helm or manning the winches. Larger cockpits may need several sets with short jacklines between them to provide sufficient coverage. G10 Garolite backing blocks for each padeye about three times the width and length of the padeye base if possible. At least two lengths of nylon or spectral tubular webbing with a minimum breaking strength of 6000 lbs, preferably with sewn loops in each end. Spectra core line 1/4″ or 3/16″ for lashing the end of the jacklines in place. Find an appropriate location for the padeyes in both the cockpit and on the foredeck. Ideally, the foredeck location should be close to centerline, allow you to reach the furler, headstay, jib, anchor windlass and bow roller without a problem. The most common reasons for being on the foredeck are working with the headsails, unjamming a furling drum or fixing a problem with the furling drum or when anchoring or weighing anchor—so being able to reach all of the required gear is a necessity. The cockpit location for the padeyes should allow you to clip in from inside the cabin, yet allow you full access to the cockpit winches, and helm. On larger boats, this may require several padeyes or sets of padeyes with shorter jacklines between them. Bed the backing plate with thickened epoxy in the proper locations for each padeye and let the epoxy cure. Then drill the fastener holes for each padeye and pot the holes if the deck in the area is cored. Put butyl tape on the underside of the padeyes and fasten to the deck with stainless steel screws. Use fender washers beneath locking nuts on the inside. Attach the jacklines to the bow set of padeyes by running the jacklines through the padeye and then through the eye loop, effectively creating a larkshead knot on the padeye. Run the jacklines aft to the cockpit attachment padeyes, and put at least a dozen twists in the webbing to prevent it from humming or singing under strong winds. Lash the eye loop to the padeye, or if you’re just installing the padeyes, run the eye loop through and over the padeye to form a larkshead knot. I think on any bluewater boat or any boat that is singlehanded any significant portion of time, jacklines should be rigged permanently. On daysails or coastal passages, it is generally a good idea to rig them if bad weather is forecasted. Also, when making longer bluewater passages and not singlehanding, I generally go by the rule that you don’t leave the cockpit at night unless you are clipped in and there is someone at the helm. The reason is simple… if you do fall overboard, you want someone to know immediately and have them stop the boat to make getting back aboard simpler.